Winter Vegetable CSA – SIGN UP NOW! As we pack the final shares of our Summer CSA this week, we think back to the first shares of the season in June and marvel at the diversity of vegetables! We thank our CSA members for joining us on the journey through the tastes of the season. The partnership we make with CSA members is our favourite part of the farm business. And it doesn’t have to end now… let’s face the winter together, and make it delicious!! We are now accepting membership for our WINTER CSA program. For more information, CLICK HERE. Tired of the “record-breaking” cold February temperatures? Close your eyes…imagine the smell of a warm, ripe tomato…now, bite into it and let the juices run down your chin… Feel warmer? Keep thinking about the warmth of spring and summer and the bountiful vegetable harvests that, believe it or not, will grow out there soon enough! Feel better? We feel warmer and uplifted as we peruse seed catalogues and plan this year’s crops. This is also the time of year when we welcome registration for the 2015 CSA (Community Supported Agriculture) membership. For those who are interested in eating locally grown produce at its best, fresh and in season, consider becoming a CSA member. Don’t cringe and fear the arrival of winter… embrace it by ensuring you have a steady supply of hearty, delicious vegetables! 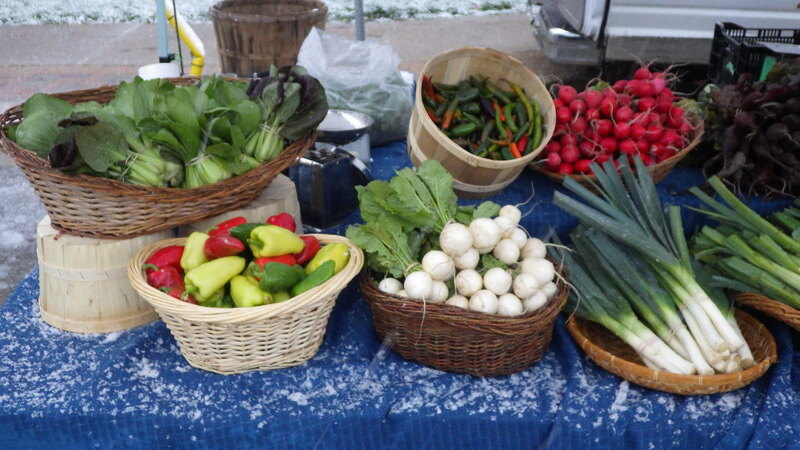 We are now accepting registration for our 2014-15 Winter CSA. CSA Registration for 2014 Season – NOW OPEN! At last, spring is in the air! We are planning our crops for the season and are now accepting registration for the 2014 CSA (Community Supported Agriculture) membership. For those who are interested in eating locally grown produce at its best, fresh and in season, consider becoming a CSA member. The CSA model is a mutually beneficial arrangement between producers and consumers. It allows people to become members of a farm and in so doing, engage in their agricultural community. After growing vegetables in partnership with CSA members for 6 years, we recognize the importance of this arrangement both financially and socially in building a sustainable and local agriculture. It is unlikely that we would be farming today if it were not for the Community Supported Agriculture model. In addition to potatoes and beets, we will also be featuring certified organic vegetable seeds from our friend Kim Delaney at Hawthorne Farm, Palmerston. We have really enjoyed varieties of tomatoes, cucumbers and peppers that we have grown of hers in the past. We will be bringing a great selection of her seeds for any of you who would like to grow some of your own vegetables this year. Consider it a mini Seedy Saturday – a chance to get excited and imagine creeping cucumber vines and the distinct smell of tomato plants! For those gardeners who would rather start with seedlings than with seeds, we will be bringing tomato and pepper plants to the first Farmers’ Markets in the spring in both Orangeville and Creemore. Looking out over the snow-covered fields this morning, having done our last outdoor markets and having delivered our final Summer CSA shares, we can now officially feel the change of season! It has been an exciting season here at Fiddle Foot Farm, very productive in vegetables and meat and also in the further development of our farm and of course, lots of learning! Thank you to all those who took part in our Summer CSA program, to our market customers, and to the restaurants in the area who chose to serve locally and organically grown vegetables. We are now accepting registration for our Winter CSA shares which will begin on November 19th. You will find all the information posted on the Winter CSA page. 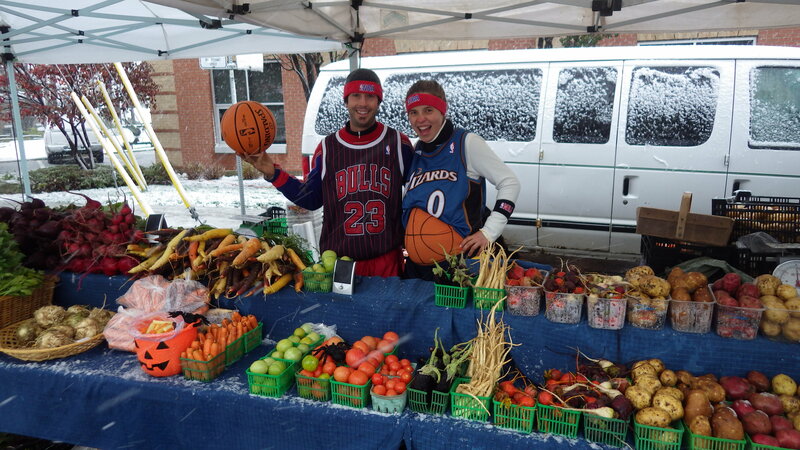 In case the blizzard kept you away from the final Orangeville Farmers’ Market, here is a glimpse of what you missed! 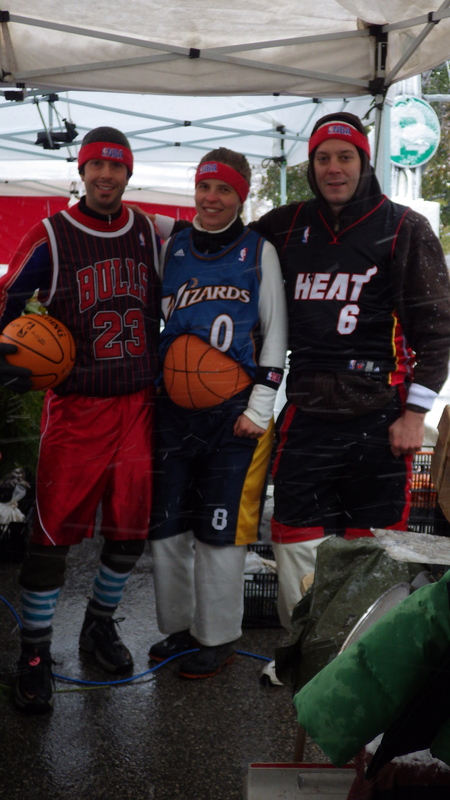 Snow blanketed our display but didn’t keep us from “sporting” our costumes in Hallowe’en spirit. Markets begin indoors in Orangeville tomorrow (November 9th) and will continue on the second Saturday of each month. 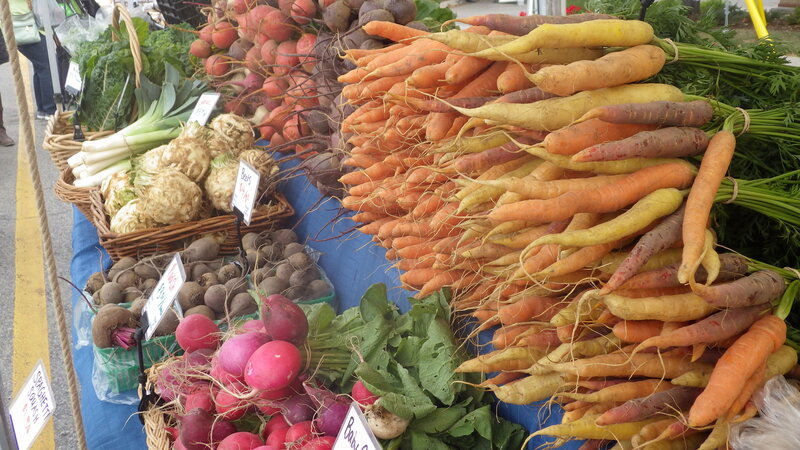 The market will be in Town Hall and will run from 8am – 1pm. Come on out if you are in the area to support local producers throughout the quieter months. We will be bringing winter vegetables, pure pastured lard and some of our preserves made during the summer months. There will also be an indoor Christmas market in Creemore on Saturday December 7th – hope to see you there! Thank you for all the interest in the CSA program. The CSA membership for the 2013 summer season is now full. Contact us to the added to the waiting list. Please let us know if you would like to be added to our Contact List to find out about our Winter CSA offering as well as pastured chicken and pork available in the fall. If you were not able to join our CSA program for this season but are interested in our produce, then please visit us at the Orangeville and Creemore Farmers’ Markets on Saturday mornings – we’ll be there all season. We are very grateful for the help and positive energy that our apprentices are bringing to the farm. Michael, Melanie and Emily are really taking to life on the farm! Day by day, we are filling the gardens with seeds and transplants. It is a very busy time of year on the farm, but an exciting one as the gardens start taking shape in reality, no longer existing only in our minds! We have been quite fortunate to receive some attention from various local media outlets. In the garden – Top right, Amy Ouchterlony divides carrots into CSA boxes. Bottom left, Rob Day in the bean patch. Lower right, Trevor Zurowski picks carrots with a friend. Photos by Pete Paterson. 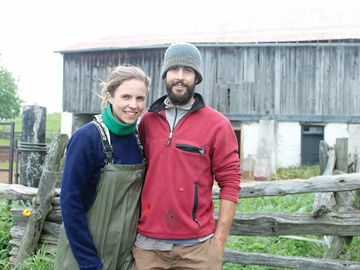 Amy Ouchterlony and Graham Corbett operate a biodynamic farm located just outside Mansfield. Thanks to a friend and avid supporter of local agriculture for the nomination, we recently were chosen as the recipient of the Dufferin Chamber of Commerce Business Award in the Category of Agricultural Excellence, which was an honour. CSA Registration for 2013 Season – Now Open! 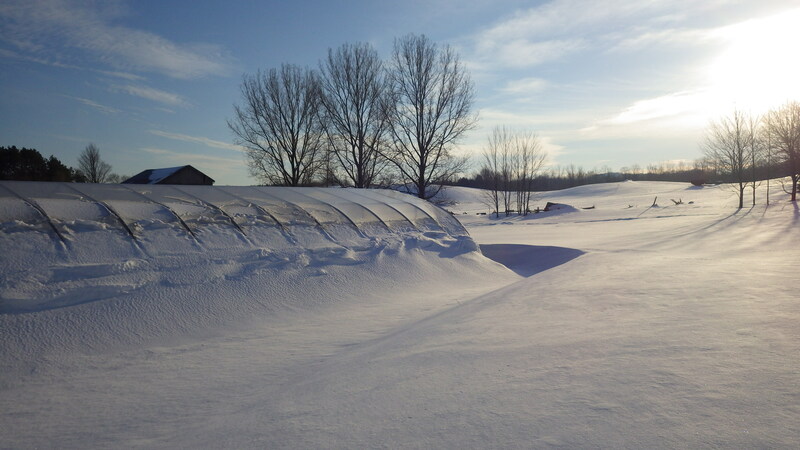 With spring right around the corner, we are planning our crops for the season and are now accepting registration for the 2013 CSA (Community Supported Agriculture) membership. For those who are interested in eating locally grown produce at its best, fresh and in season, consider becoming a CSA member. The support of our CSA members plays a vital role by providing not only up-front financial security but also the value in knowing for whom we are growing food! !